Creating interiors that take your breath away and stand the test of time, is at the heart of our design ethos. Established by Louise Walsh in 2010 after 15 years of industry experience, Louise Walsh interior design & decoration is a design and decoration firm committed to crafting warm, gorgeous and practical spaces for our clients to live and play in. Every project is a (fun) labour of love. so that you play an integral part in creating the home you desire. marine design and luxury resorts. But we’re more than just a design firm. We’re passionate about people. Each project and client is unique and individual. Our clients are just as important to us as the interiors we design. In fact, the two are intrinsically entwined. We work with our clients to intimately understand their brief and how they live and move between spaces day to day. From the contemporary to the classic, we help our clients achieve their own beautiful aesthetic, to fuse form, flair and function and to inject personality, continuity and comfort into their space. We work with best artisans in the industry, incorporate high quality finishes and use custom-designed furniture to ensure the correct proportion, finish and ‘language’ is spoken throughout every home. Through our wealth of knowledge and experience, we create timeless interiors that make your heart flutter when you see them. Our head office is in beautiful Lennox Head with studios also located in Brisbane and Sydney. We're grounded in nature and inspired by the world around us. Our projects take us to busy site meetings in busy cities around Australia and the globe. Then we quietly return to our little bit of beachside paradise, to design and create unique havens for our clients. Louise's approach to interior design is honest and straightforward. With over 16 years experience in leading interior design firms in Brisbane, Sydney and London, she established Louise Walsh interior design & decoration to create breathtaking interiors for her clients which exceed their expectations. Having collaborated with architects, builders, fellow designers and contractors in Australia and the UK, Louise is firmly focused on creating quality residential interiors that reflect her clients and the way they like to live. Colour, texture, tone and proportion are all essential in orchestrating her client’s vision to create a truly beautiful home they will treasure for years to come. Louise believes that there is an interior for everybody and loves nothing more than revealing that to each of her clients. She believes that proportion, balance and restraint is required in every interior and thrives on working in a team environment. A cheese and pasta addict, you’ll often see Louise’s kelpie ‘Kobi’ lounging about in the studio as she designs to her heart’s content. Louise prides herself on developing an exceptional rapport with her clients and customises each project in response to the clients’ brief, architecture and environment. Skilled at project management from conception to completion, Louise is also adept at designing rugs and bed linen. Louise's divine bed linen range has featured in a number of publications and Louise was a Top 6 finalist in the Designer Rugs Evolve Awards 2010. Her rug now forms part of the I.D Collection at Designer Rugs. Perth-born Kelly's love of the outdoors brought her from Sydney to our beautiful north coast to join the Louise Walsh design team where she thrives on her desire to simply create. Having worked in the fashion industry for many years, Kelly loves designing spaces that push the boundaries of what is known or expected. Using unexpected materials for a different purpose and with a keen eye for unique details, Kelly creates stunning spaces that her clients can relax in and which truly reflect their lifestyle. Pia has always had a knack for making ordinary things beautiful. Growing up in a remote area in Malawi, she adopted a talent for all things design from a young age. Her childhood was free and quite wild at times and this eccentric lifestyle lead her onto a creative, hands on approach to life. Pia is captivated by the landscape and cultures of the world and this is what fuels her passion for eclectic design. She is particularly interested in objects and spaces working together to tell a story, creating a stronger connection between people and their surrounding environment. Since graduating from RMIT in Melbourne she has worked in Marketing, Interior Design and more recently Creative Direction in Fashion Design, creating her own label inspired by natural plant based textiles. Her inspiration and experience has crossed many borders to characterise the unique eye for detail and design she showcases today. In 2016 Louise Walsh Interior Design & Decoration was included in the international acclaimed Andrew Martin Interior Design review and was also acknowledged nationally receiving the Dulux Colour Awards Commendation for Best Residential project. 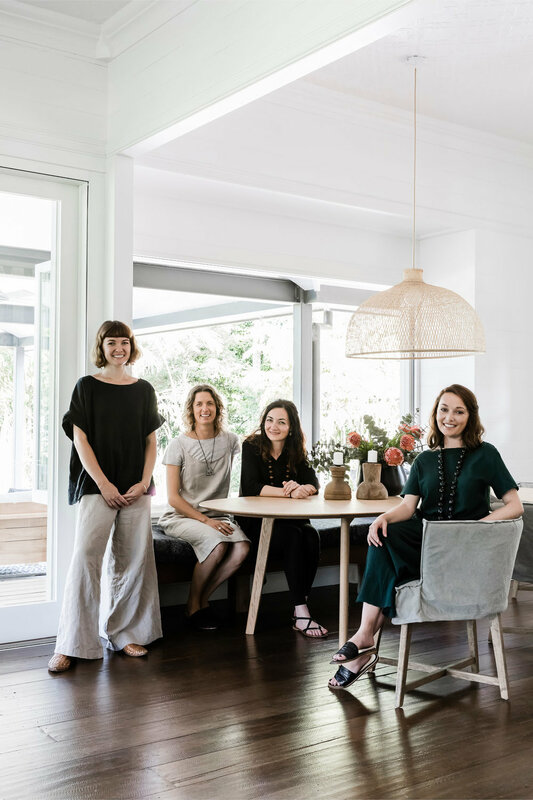 Some of the many Australian magazines, which feature the work of Louise Walsh Interior Design & Decoration include, Madison, House and Garden and Belle. Recent projects include a luxury beach house in Newcastle, a spacious family home in San Francisco and a historical home in Brisbane, Australia. Current projects include a luxury villa on Hamilton Island, a Gold Coast penthouse and luxury homes in Brisbane and Sydney, Australia.